Credit: Public notice by Kenya Film and Classification Board. Update: After public outcry, the KFCB has changed its stance. A new law is set to come into effect from May 28th, 2018 in Kenya regarding the publishing and broadcasting of any videos for public consumption. Specifically, the Kenya Film and Classification Board (KFCB) states that, according to the law, anyone in Kenya broadcasting any videos for public viewing (including on social media and the Internet) will be required to have a filming license. 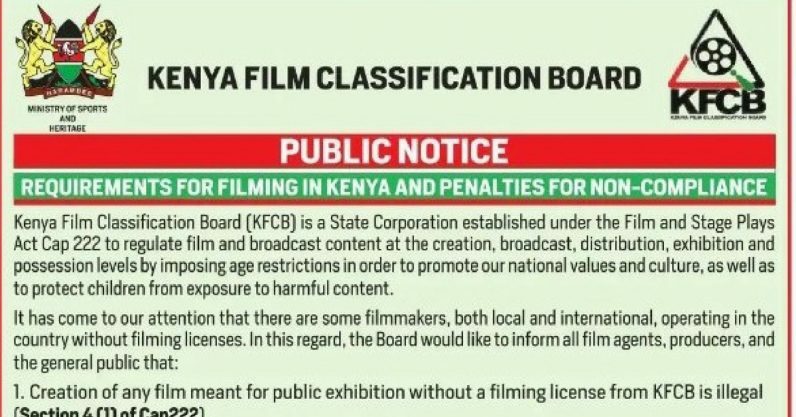 Public notice by Kenya Film and Classification Board. Those who fail to register for a filming license with the KFCB face imprisonment or a fine. “It has come to our attention that there are some filmmakers, both local and international, operating in the country without filming licenses. In this regard, the Board would like to inform all film agents, producers, and the general public that creation of any film meant for public exhibition without a filming license from KFCB is illegal,” reads part of a statement from the KFCB. Speaking to the media, Ezekiel Mutua, CEO at KFCB, emphasized that the regulation applies to any video, including those recorded using mobile phones, as long as it is meant for public exhibition. Mutua further explained that public exhibition includes publishing the videos on social media and the internet. KFCB have given those looking to continue publishing videos for “public exhibition” until May 28th, 2018 to register for a license. Failure to register will carry a maximum fine of KSh 100,000 ($1,000) or a maximum prison sentence of five years. Many Kenyans have criticized this regulation and some have stated it amounts to censorship considering how the general public will not necessarily be interested in getting a filming license. The punishment, likewise, is also harsh. However, it will be near impossible for the KFCB to enforce and monitor this in a scalable way. Previously, Mutua proposed a law in Kenya to ban the use of pseudonyms or fake names on social media.